Jason Ladayne’s growing reputation as a top-notch card man has been advanced with his sophomore release, Game Changer. This book, in a nutshell, is amazing. The content is great, the design and layout are awesome and the delivery of the content is remarkable. “Game Changer is a sensational collection of magic and gambling effects with cards. This book picks up right where Jason’s critically-acclaimed debut, Confident Deceptions, left off. Jason has once again raised the bar with 18 new, powerful effects, gorgeously illustrated with 225 stunning, high-quality, full-color photographs. There is nothing in the ad-copy that I disagree with. This book is not for beginners. There are many sleights that need to be mastered in order to perform the tricks taught within the 350 pages. The very first chapter is in fact a lesson on how to do the sometimes dreaded pinky count. There is a fair amount of perfect faro so start practicing, again! These tricks are not quick and easy ones to learn and perform immediately after reading. You will need to put in the time to get the moves down to a science. This is pro level stuff. The book itself is great looking. It has some real heft to it. The pictures contained in the book are excellent and plentiful. The descriptions for the tricks are very detailed and can be lengthy, but appropriately so. At the end of each trick section there is a portion called “Patter” in which Ladanye lays out what the performer says word-for-word. It is as if you are reading a transcript of the words that you will be speaking if you perform the trick. All around great, great, great! The book itself is 9 inches tall and 6 inches wide. The card stock is quality glossy paper. Vanishing Inc, is really establishing themselves as a reliable source for magic publication. I am expecting that Ladanye will release a DVD with his execution of these tricks, because he could, he should and we will happily buy it. 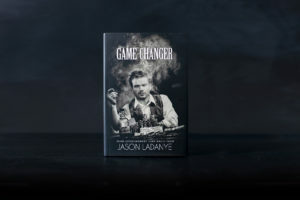 Ladanye credits the magi that inspired him and whose moves he borrowed and in return world-class magicians such as Darwin Ortiz, Jack Carpenter, Michael Vincent, Simon Aronson and so many more endorse this book. Standing Out: A card is selected from the deck and its identity is kept a secret. Next, the performer locates three of a kind from the deck. Let’s assume he cuts to the three Fives. The performer claims the fourth Five is in the spectator’s hand. When the spectator reveals her card, it turns out be a Queen. The performer instantly turns the three Fives into three Queens. Game Changer: Two cards are selected and initialed by the spectator, one for the performer and one for the spectator. The spectator writes her name on one of the cards and writes the performer’s name on the other. Both cards are then shuffled into the deck. The performer states he will deal the cards one at a time onto the table. Whoever’s card hits the table first wins a hundred dollars. When the dealing begins, the spectator’s card lands on the table first. However, the performer provides evidence that he has still won the bet. Catch Me if You Can: The performer plays three games with the spectator. For every game they play, the performer offers a chance to win money. Each game is a simple contest to see who can react quicker. No matter how impossible it seems, the performer wins every time. Nick of Time: The performer boasts he can locate the four Aces and four selections in less than a minute. Four cards are selected and then lost in the deck. The performer is able to miraculously achieve his goal while keeping the audience in suspense right up to the last second. Lucky Charms: The performer displays three lucky charms. They consist of a Chinese coin, a die, and a folded, blue, dragon-backed playing card. A spectator selects and signs a card from a red-backed deck. The card is lost back into the deck. The performer uses the three charms to attempt to divine the selection. All three attempts fail. However, the odd-backed folded card (that’s been in full view since the beginning) turns out to be the signed selection. The Wire: The performer steals four initialed cards from under the spectator’s hand under the closest scrutiny. Ladanye’s Ultimate Triumph: Four cards are selected. The deck is mixed faces into backs and the selections are lost into four different places. 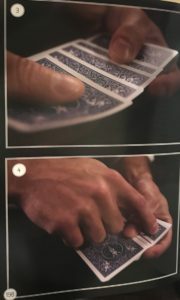 Not only does the performer instantly find all four selections, he causes all of the remaining cards to face the same way. Liar Liar: The performer offers to teach the audience a simple trick. He demonstrates how a selected card can be found by instantly rearranging a shuffled deck into perfect sequential order. Royal Exchange: The performer causes a spectator’s poker hand at any position to change places with his poker hand under the fairest conditions. Dead Center: The performer gives a stunning display of center dealing. A spectator shuffles the cards and then names any card. Let’s assume she chooses the Nine of Hearts. 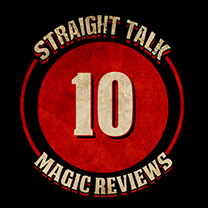 The performer repeatedly deals himself the spectator’s signed Nine of Hearts from different locations in the deck. To make it more of a challenge, the spectator shuffles her selection into the deck. When she hands the deck back to the performer, he instantly center deals her card again. Immediately after dealing her selection, he center deals himself the three remaining Nines. A Numbers Game (Ladanye’s ACAAN): The performer demonstrates two methods of cheating. First, he shows how it’s possible to track a card during a thorough shuffle. Then he demonstrates that it’s possible to instantly and invisibly move any card to any position in the deck. Hold ‘em Hustle: The performer states he can stack any two cards from anywhere in the deck in just two shuffles. Two spectators each select a card to make a Texas Hold ‘em hand. The cards are lost in the deck exactly where the spectators choose. The performer shuffles the deck twice and deals the cards. Not only does he successfully stack the spectators’ cards, he also manages to win the hand with the four Aces. Cheaters: Red-backed Aces become blue-backed Aces when the performer wears a special pair of glasses. Fast Track: The performer demonstrates how it’s possible to track and steer cards during a thorough series of cuts and shuffles. Aces Anonymous: The performer offers to play a game of poker without cheating. A spectator is asked to remove the four Aces. They are sealed in an envelope, placed in a wallet, and pinned under the spectator’s hand. The performer somehow still receives the four Aces. High-Card Hustle: The performer plays a game of high-card cut with the spectator. Even though the performer offers the spectator tremendous advantages for each game, the performer always wins. Power Play: The performer demonstrates two ways to gain an advantage in a card game. First, he shows how he can correctly read poker tells. Then, he gives a demonstration of multiple false deals. The performer concludes by false dealing five hands of four of a kind from a deck the spectator shuffled. The Art of War: The performer and a spectator play a game of War. No matter what the circumstances, the performer wins every single hand. For $60 bucks you get 18 tricks. This book is well worth owning. You will read it slowly, learn and practice as you journey towards the next level. Thanks to Murphy’s Magic for asking me to review this excellent book!